Ask The Mayor: Can I Get a Slow Down Sign on My Street? Celebration of the Arts Honors "Love for All Things Planted"
Maui Electric Tilapia Whoppa Winner 2015 Isaac Imamura. Photo credit: Maui Electric. 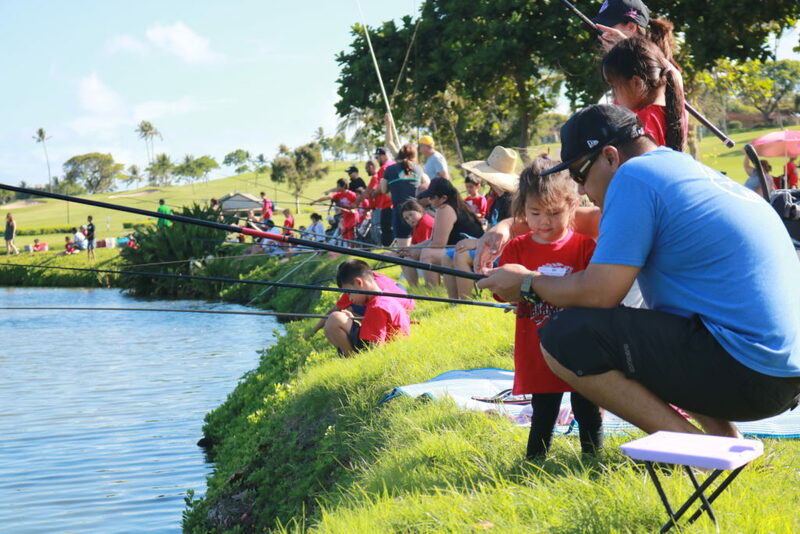 Maui Electric and Kā‘anapali Golf Courses invite keiki to cast their poles at the 8th Annual Keiki Tilapia Fishing Tournament on Sunday, Sept. 4, from 7:30 to 9 a.m., along Kā’anapali’s 18th fairway as a benefit for Maui United Way. This “tag and release” event is open to youth ages two to 18 years old with a registration fee of $20 per participant and includes an event t-shirt. For the first time, registration can be made online to the first 250 participants. 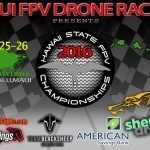 Registration forms are also available starting today at the Maui Electric Customer Service Lobby (210 W. Kamehameha Avenue), New Maui Fishing Supply in Wailuku, Maui Sporting Goods in Wailuku, and the Kā‘anapali Golf Courses Golf & Resort Shop. Registration will be open until the 600-participant cap is met or June 22, 2016, whichever comes first. 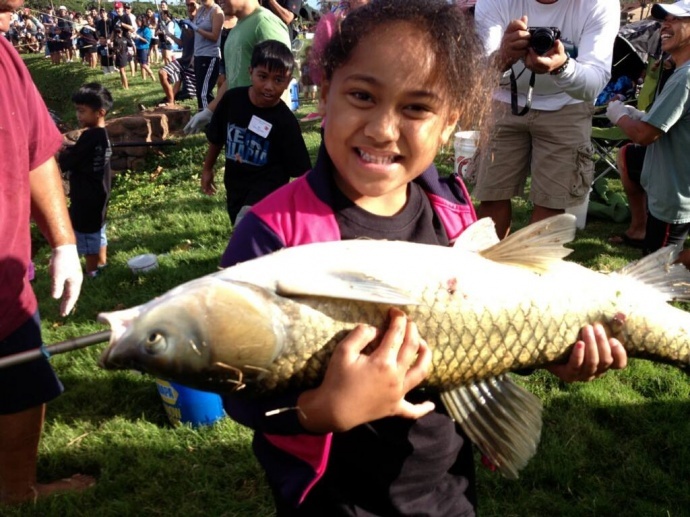 Makanani Kahaialii reeled in this huge carp during the MECO 2013 Keiki Tilapia Fishing Tournament. It was too big to weigh on the tournament scales and was returned to the pond. Makanani took home the first place prize for biggest non-tilapia fish, and possibly the biggest fish ever caught in the tornament. Kahaialii ‘ohana photo. 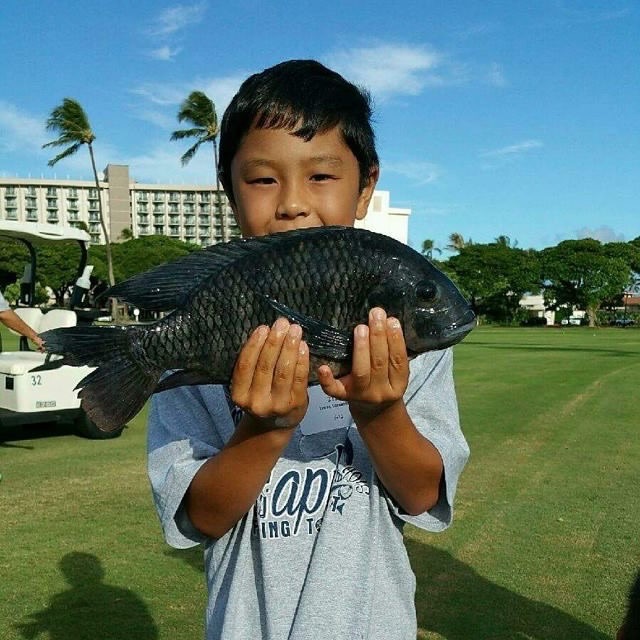 During the tournament, keiki will be vying for the “Biggest Tilapia” of the day in their age category. Last year, more than 100 Maui Electric employees and their families helped to organize and volunteer at this event that raised more than $19,000 for Maui United Way, a non-profit organization that raises and invests corporate and individual donations in over 37 health and human services partner agencies and programs to benefit the Maui County community.